You are here: Home » Pick Your Poison: Pumpkin Beers or Oktoberfest? ‘Tis the season for Fall beers (literally – look at the calendar). And there are two styles of beer that typically mark the season: Pumpkin Beers and Oktoberfest Beers. I haven’t had either yet, but the beer fridge is barren and I’m due for a trip to the beer store. When I go, I’m gonna load up on the styles I like, as it’s always stout season in my garage. But I’m also going to pick up a seasonal or two just to be a good little beer nerd. Giving it some thought, I realize that I’m interested in a couple of pumpkin offerings, but I really don’t have a desire to pick up any Oktoberfest beers. If I was at a festival, sure, but I’d rather enjoy other goodies while at home. How about you? If you had to choose between the two, which way would you go? Or are you one of those “I’m an enlightened beer drinker and enjoy both” kinda person? Or are you a “Keep your seasonal gimmicks and point me to the good stuff” type of beer nerd? As I write this, I realize that it’s probably easier to just do a poll. I’ll post one below to simplify things. Also feel free to leave a comment about why you voted the way you did. Not that you have to explain yourself, but I’m curious to hear your approach when it comes to seasonals. Maybe you’ll get me in the Oktoberfest spirit and convince me to pick up a couple of marzenbiers. Who knows? And try not to let the picture above influence your decision. 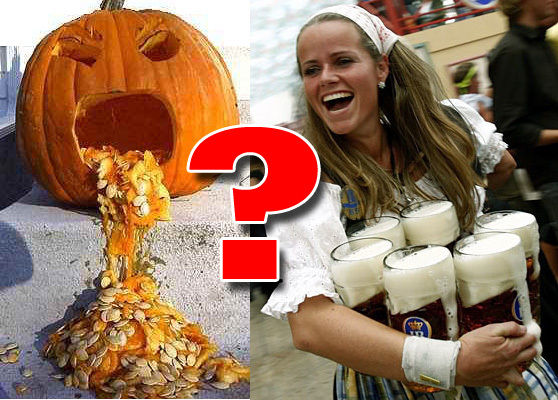 I just love that puking pumpkin pic, but I realize it’s kinda gross compared to a beer maiden. Personally, I like them both and enjoy them in different ways. I tend to enjoy Oktoberfests more with food where I enjoy sipping a pumpkin beer better by itself. You’re right about that Scooter. Oktoberfests pair with lots of stuff, while Pumpkin beers can be a challenge that way. I mostly drink beer without food, so that might explain why I’m leaning towards pumpkin. I’ve had amazing examples of both. But overall, I tend to enjoy a good Octoberfest far more. Unfortunately, most small breweries’ Octoberfests are Octoberfest, or Marzen recipes fermented with ale yeasts, and really don’t have that “something special” that a good Octoberfest has. And to add to your recent Sam Adams podcast discussion: Theirs is fantastic! My favorite pumpkin ale, and the only one I regularly buy, is Elysian’s Night Owl. It’s actually brewed by New Belgium, but has the Elysian label on it. I’ve never had the Night Owl – I’ll have to look for it. As far as Oktoberfest beers go, I rarely get past Sam Adams Octoberfest (usually at a friends house or a party) and Victory Festbier. I’m good for maybe one or two. But then again, that’s about my limit for Pumpkin beers, too. The Bruery’s Autumn Maple is an entirely different story – I horde that stuff! Mmmm… I should pick up some Autumn Maple. Haven’t had that yet, but it sounds divine. If you can’t find the Night Owl, let me know. I might just get you some (legally driving it to you of course. I’d never break the law and send it USPS). Thanks for the offer Evan. We usually have a good selection Elysian’s at my beer store, but I’ll let you know. Likewise with Autumn Maple. Lemme know if you can’t find any and I’ll hook you up. We get all of The Bruery’s stuff here, so I shouldn’t have an issue. Thanks though! Cool. I hope you like – let me know. How about a pumpkin Oktoberfest? Thanks for the idea, I am definitely going to make a pumptoberfest. Love it! You’re bringing two worlds together, Trevor. Actually, you just put me in the mood for an Oktoberfest and a slice of pumpkin pie. Maybe we can all get along after all. My fall beer recipe this year (changes annually): Sweet Potato Imperial Brown aged on the oak cubes from my recent bourbon/oak Imperial Stout. Oooh! Now you’ll definitely have to ship me, er, deliver me some!! I’m gonna chime in with another vote for the Sam Adams Octoberfest beer. It is really drinkable this year and a really nice malty treat. I personally don’t like most pumpkin beers. The ones I do like don’t taste too much like pumpkin. For example Shipyard Pumpkinhead and Smashed Pumpkin both have big gingerbread tastes to them and that is pleasing to me over pumpkin. So I enjoy those. But I really do love me marzens. Spaten, Ayinger and even Sam Adams make awesome Oktoberfest brews that I love during this time of the year. I like the gingerbread taste some pumpkin beers have as well, Mike. I think it’s perfect for the season. Funny thing is as the day goes on, I’m getting more and more in the mood for Oktoberfest beers. Maybe I’ll pick up a Sam Adams or a Victory Festbier. On the homefront, I like Victory’s Festbier. As far as German examples go, I love Ayinger. Both are excellent, and I’d drink quite a bit of either. I hate pumpkins, so I tend to keep that crap out of my beer. I’ve tried some, and each has hit the sink. It’s as if someone defecated in the bottles. Gross. I could’ve guessed you’d go away from the pumpkin beers, Scott. I have a feeling if I put curdled milk served in a dirty ashtray up against pumpkin beers, you’d choose to chew cheese and cigarette butts! Last time I was in Boonton they had Autumn Maple. I also got some last year from Amanti Vino in Montclair if you’re ever over there. Tnx. I’ll need to make the trip to one or the other! There was one Autumn Maple on the shelf in Boonton last night, but someone bought it. I can email Kevin over there and see if he has any more if you’d like. I’m sure he’d hold one for you. I’m just getting in to expanding my beer drinking horizons after years of the big boys. With that said the thought of the pumpkin brews really excited me so I’ve been trying as many as possible. Haven’t found one yet that really excites me to much. I’ve had the DFH, Post Road, Saranac, and this morning after work I tried out the Sam Adams offering. So far I like the Post followed by Saranac, than the DFH followed by the Sams. The latter two were to vegetably wheras the first two had some spice which was appealling to me but not great. I’ll keep tasting though and see where it goes. All that being said the one oktoberfest I have had this season(Sam Adams) beats them all. I’ll try more this weekend though as I’m going to an Oktoberfest festival this weekend at the local Ale House. 80 beers on tap and over 300 beers from around the world! I had a Pumpking last night and it got me in the mood for Pumpkin beers for sure. But your Oktoberfest at the Ale House sounds like it’ll offer a variety of awesome Oktoberfest beers, which would also be a real treat. Have a great time! It should also be pointed out that many, if not most “pumpkin beers” aren’t actually pumpkin beers. Most are “pumpkin spice” beers, but don’t have pumpkin in them. The really good ones have yams or sweet potatoes. I’m looking at you, Autumn Maple! Just had a Jack’s Pumpkin Spice Ale (really pretty flavorless…shoulda seen that coming) and a Sam Adams Harvest Pumpkin (not bad, but too much vegetal flavor for my tastes)…….in short, nothing to match the autumn-in-a-bottle wonderfulness that is DFH Punkin’ Ale. I remember Punkin being wonderful from last year. I also had a Southern Tier Pumpking last night (actually I stole a nip from my wife’s bomber!) and it was very good too. I’d like to compare them side by side, actually. Anyway, the DFH is great, and I recommend the Pumpking if you can find it. Does Avery do a pumpkin beer? I bet it’d rock!